Sub also called a submarine sandwich, hero, grinder, baguette or hoagie is a sandwich made out of a long bread roll filled with different sorts of meats, cheese, vegetables and sauces. This type of bread was created in America by the different Italian American Communities during the late 19th to mid-20th centuries. Though the exact origins is still unknown one popular theory say that it was bought and developed by an Italian immigrant named Dominic Conti in New York during the early 1900s. They believed that he had named the sandwich after seeing the submarine called “Fenian Ram” in Paterson Museum, New Jersey. Conti’s sandwich was sold on his own grocery store located in Mill Street in Paterson, New Jersey. Originally it was made from a recipe he brought with him from Italy where it consists of a long crust roll layered first with slices of cheese then filled with different cold cuts, lettuce, tomatoes, peppers, onions and Italian herbs and spices then topped again with layers of cheese to prevent the moist filling making the bread soggy. From here on the popularity soared and lots of varieties were created like this post that we had today. I guess of all subs out there nothing get more Italian than this meatball sandwich, it’s even more Italian than the first version Conti made. To make it even better we will finish this up by baking it with a mixture of parmesan and mozzarella. Soak breadcrumbs in milk for at least 15 minutes. In a bowl combine the soaked breadcrumbs with the rest of the meatball ingredients, mix it evenly and form into ping pong sized balls. On a deep pan, add oil and shallow fry each meatballs until it turns light brown in colour do not cook well, we are just browning the outside. This will take around 3-4 minutes each side. Set aside. On a separate pot add oil, sauté remaining garlic and onions. Once onion turns translucent add the red capsicum and cook for 3 minutes. Add the chopped tomatoes, red wine, tomato paste, oregano, basil, bay leaves, salt (according to taste) and freshly ground black pepper. Bring to a boil. Slice sub up to ⅔ of the width in the middle lengthwise. 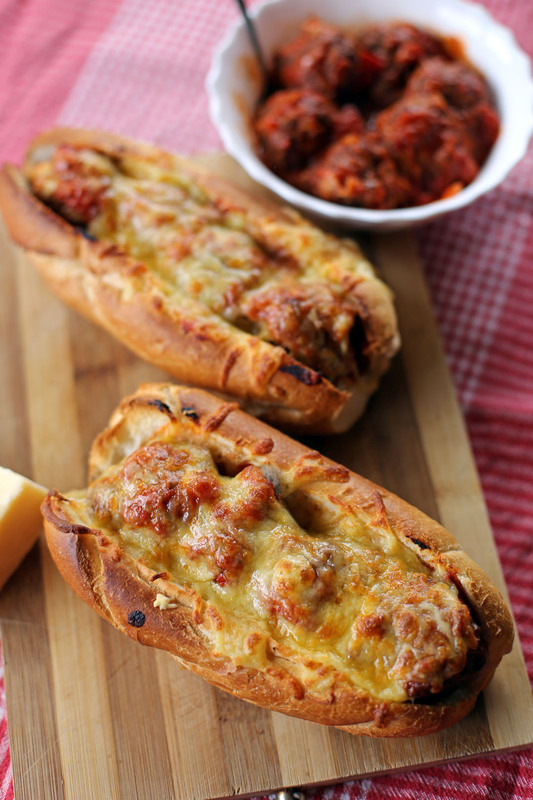 Place slices of cheese in the middle creating a layer covering the bread then scoop out meatballs with a bit of sauce and place it on top of cheese (place around 4-5 meatballs) then top it with parmesan and loads of mozzarella cheese. Place a 220C pre heated oven then bake until cheese melts and golden brown on top. Remove from oven then serve immediately. 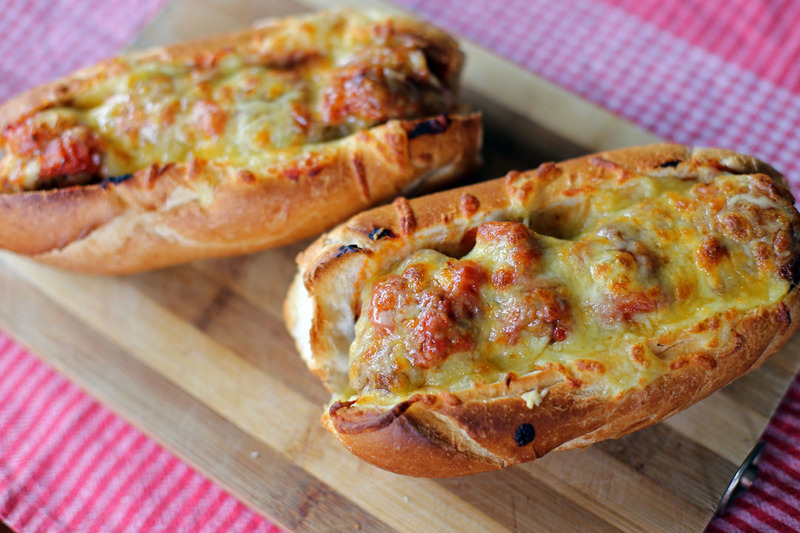 Oh, this does look like a fab sub – Raymund. These subs looks absolutely delicious… My husband would be happy to have them for dinner. What a great idea, and still they look so delicious!